This Thanksgiving we were lucky enough to be included as “family” at our good friend’s house. They would do the turkey, potatoes, gravy, stuffing and some other traditional sides. We would bring our own family traditions to the table as well. 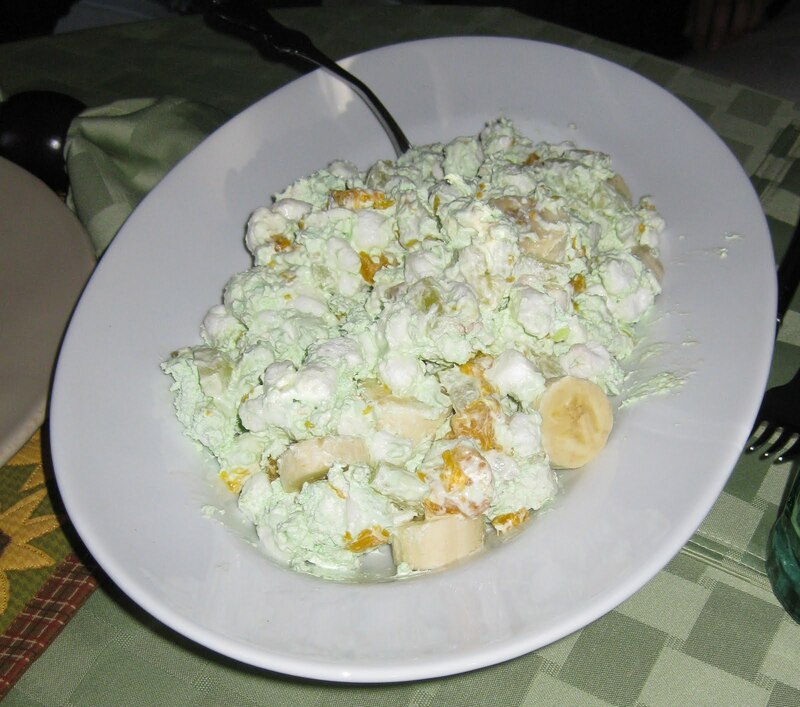 Not necessarily on every American’s dinner table at this food-centric holiday is the salad/dessert we call “Fluffy Green.” I encountered the delicacy a few years ago when I celebrated my first Thanksgiving with my boyfriend’s (now husband) extended family. I was a bit wary of the green goo but went for it with an aggressive spoonful. Oh. Wow. Mix Jell-O into Cool Whip, add everything except the bananas (be sure to drain fruit). Add bananas just before serving. Now, it doesn’t look amazing, or even sound like something gourmet. And it’s not. But it’s tradition and tasty, and on Thanksgiving you can’t ask for more. In my searching for other people who share this meal on Thanksgiving I came across many opinions. Some balked at the idea of a “marshmallow salad” and others said their grandparents introduced it into the family during the Depression. To our hosts, we were honored with surprising them with how great it tastes! Even the 11-year-old finicky child took multiple servings. Another great Cool Whip salad often served in wintertime in the Midwest is the Snickers salad. Snickers AND salad, you ask? Trust your taste buds. Trust me. Mix Cool Whip and pudding mix. Add chopped snickers (about a 1/2 inch thick each) and chopped apples. Mix and serve chilled. Kids love this one, too! Love the Snickers Salad; can't ever go wrong with that!